Twin Vee PowerCats is releasing an open letter from its CEO Joseph C. Visconti to shareholders, customers, dealers, vendors and current owners of Twin Vee PowerCats. This Open letter is a communication to bring Dealers, Customers, vendors and future Customers up to date with the operations of the Company. "I want to take this opportunity to introduce myself as the New CEO of Twin Vee PowerCats, Inc. First off, I want everyone to know the reason my company acquired Twin Vee is because of its long history of producing great products that I consider to the Best Riding Boat on the Water. We are working to make them even greater." "I come to the marine industry with a background in finance and corporate turnarounds. My initial due diligence focused on the future potential market for power catamaran boats. It became clear to me that, with the many benefits of dual-hull design, the power catamaran market is underserved. If a company is committed to designing, manufacturing and marketing a series of high-quality power catamarans at an affordable price, that company could compete with other power catamaran manufacturers, but also the best mono-hull brands. I believe with the changes currently underway that Twin Vee has unlimited potential and opportunity to capture a growing market share of the fishing, family and recreational boating market and also rapidly expand its customer and dealer base. This is what we have set out to do, and we are already showing promising results with a rapidly expanding dealer network that has brought a significant boost in new orders." "As many of you know, Twin Vee has been building dual-hull powerboats for more than 20 years. 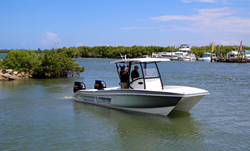 The company, along with the entire marine industry, has been through some ups and downs, My total focus and goal is to put Twin Vee PowerCats on a solid growth footing and expand on its traditions of innovative design, quality craftsmanship and a superb, yet affordable, boating experience." "With a 100 percent acquisition of Twin Vee completed, I have installed a new management team that is intensely committed to major innovations across the board. My factory-wide initiatives are to focus on better quality production through a semi-automated manufacturing process that includes investment in multiple CNC machines, a 120-foot overhead crane, new tooling and new molds. Additionally, a computerized inventory program has been installed to reduce waste and improve assembly efficiencies. Our overriding goal is to better serve our customers through forward thinking and precise execution." "I’m proud to announce that the new 2017 TwinVee PowerCat product lineup exemplifies this vision of quality manufacturing, performance and an unwavering dedication to customer service. We are introducing two new models, the 230 and 360, to our OceanCat series in addition to the 260 and 310. OceanCats are now divided into two editions, the Sports Edition (SE) and Tournament Edition (TE). These new editions represent a departure from Twin Vee’s build-to-order manufacturing practices of the past, and now include standard high-quality features that were formerly considered options, even though they are necessary for a well-appointed boat." "I hope you will visit http://www.twinvee.com to view the entire 2017 lineup, including our 170, 190 and 220 BayCat series, and download a specification and feature product sheet for each Twin Vee model. I think you will agree that the New Twin Vee 2017 models now have many additional standard features that are too numerous to mention here." "The smooth ride, stability, durability, affordability and fuel-efficiency that are the heart and soul of the Twin Vee experience have not changed, but our new management team is building a company that better serves the boating community and provides increased opportunity for our employees and dealer network. I realize that some of our older customers and dealers might miss factory customization, but I know they will not miss the long wait times for delivery. And don’t worry about price. We took months to design and build our Sports Edition packages and feel confident that if you take the time to review all the features now included on your favorite Twin Vee model, you will find great design and functionality for pricing that is actually better than before." "To sum up: there is a new energy here at the Ft. Pierce home office and plant. We all look forward to serving you as the NEW Twin Vee PowerCats." This press release contains statements, which may constitute "forward-looking statements" within the meaning of the Securities Act of 1933 and the Securities Exchange Act of 1934, as amended, by the Private Securities Litigation Reform Act of 1995. Those statements include statements regarding the intent, belief or current expectations of Twin Vee PowerCats, Inc. and members of its management, as well as the assumptions on which such statements are based. Prospective investors are cautioned that any such forward-looking statements are not guarantees of future performance and involve risks and uncertainties, and that actual results may differ materially from those contemplated by such forward-looking statements. The Company undertakes no obligation to update or revise forward-looking statements to reflect changed assumptions, the occurrence of unanticipated events or changes to future operating results.